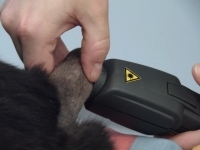 Nottingham Animal Hospital has invested in a Class IV Therapy Laser!! We have been seeing tremendous improvement in many conditions. Ask us about this painless therapy for your cat or dog!! Class IV laser therapy is the use of an intense beam of laser light directed into tissues to reduce pain, reduce inflammation and accelerate healing. Laser therapy is the result of electromagnetic energy interacting chemically and biologically with tissue causing "photobiostimulation" or "photobiomodulation." The involvement of electromagnetic energy in biological processes is not a novel concept - it fills our environment, as photosynthesis occurs in plants and literally surrounds us, as Vitamin D is formed in our skin cells. The idea of light producing healthful tissue effects is as old as science itself, noted, but not understood, by early Greek physicians. Medical use of light in the modern era predates the development of lasers, which have transformed light therapy. Lasers allow light therapy to be targeted, specific and quick. This therapy has been safely used in Europe for over 30 years. Lasers produce a single wavelength (monochromatic) beam of light, collimated as it is generated. Laser light has the property of being coherent, or in phase, which, in simple terms, means it is uniform and very orderly light. Class IV laser therapy uses a simple beam of light - monochromatic, coherent, collimated light - to penetrate deeply into tissues and produce positive tissue changes. What Does Class IV Laser Therapy Accomplish? 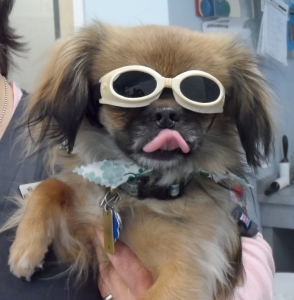 Laser therapy reduces pain, reduces inflammation and accelerates healing. How does it reduce pain? Through its effect on nerve cells and nociceptors, increased stimulation thresholds, reduced neuronal impulses, and increased release of tissue endorphins, pain perception is decreased. How does it reduce inflammation? Inflammation is reduced by decreasing release of prostaglandins and inflammatory mediators, by increasing macrophage activity and leukocytic phagocytosis, and, by reducing edema through dilation of lymphatic vessels. How does it accelerate healing? Healing is accelerated by increased blood flow from vasodilation, by increased angiogenesis and capillary production, by increased release of cytokines, and by stimulation of fibroblast activity and collagen production. How do photons (little packets of electromagnetic energy) produce such dramatic biological changes? The list of documented mechanisms and effects in laser treated tissue is extensive. Electrical, temperature and pressure gradients are created as coherent laser light is polarized by the mixed density of tissue. Chromophores - photon absorbing chemicals and structures in tissue, cells, and sub-cellular organelles - absorb the electromagnetic energy. Electron chain transport mechanisms in mitochondria, cell membranes and epithelial tissues are stimulated. ATP production increases, and DNA and RNA synthesis is increased. Enzymes (such as the cytochrome oxidases) are directly stimulated. With further research, a more complete understanding of this exciting technology will emerge. My 13 year old yellow lab had been showing signs of arthritis in his hips for a while. He was stiff and slow to get up, he had trouble with stairs, and although he still enjoyed his walks, they had become slower and much shorter. He was already on a prescription diet, joint supplements and an anti-inflammatory medication, and although they were helping, the symptoms continued. 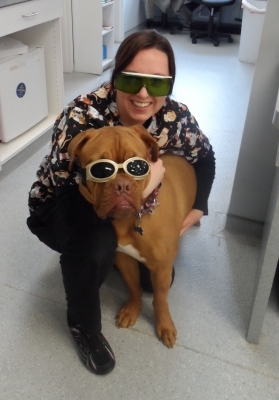 I heard that laser therapy like they use on athletes with sports injuries might be helpful for dogs with arthritis so decided to give it a try. A treatment course of 5-6 treatments over a 2 week period was recommended. I didn't really notice a lot of difference after the first treatment, but by the third or fourth my dog was standing taller, getting up and moving easier, and even trotting on our walks. By the end of the treatments he was actually bringing me his toys and wanting to play—he hadn't done that for a few years! Now he goes for a follow up treatment once a month and although he is no puppy, he acts so much younger and seems a lot happier! I'm so glad I tried the laser therapy and would recommend anyone with a dog (or cat) suffering from arthritis to give it a try—you and your four legged friend will be glad you did!